Law of Attraction Laser Coaching is a short, 15-20 minute session during which we focus on one particular aspect of your life in which you feel stuck, stressed, or otherwise discombobulated. 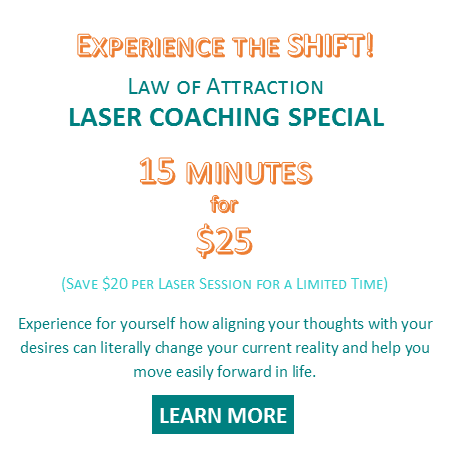 Because our thoughts create our reality and attract into our lives more of what we’re thinking about, Law of Attraction Laser Coaching quickly identifies your current mindset regarding your topic and shifts your thoughts to align more with what you are wanting and less with what you are not wanting. This then allows you to release your resistance and negative energy surrounding your topic and begin to easily attract to you whatever it is that you desire. Law of Attraction Laser Coaching sessions are fast, focused and intense. We get to the heart of the matter quickly, identify the gap between where you are and where you want to be and then close that gap. Why book a Law of Attraction Laser Coaching session? To experience a shift in perspective and energy alignment.